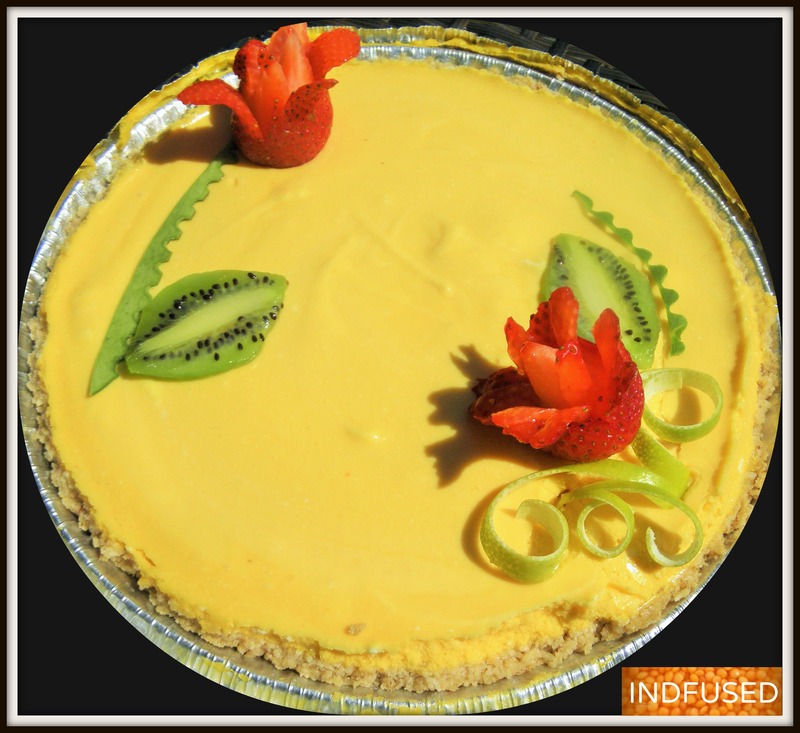 This delicate, fluffy, velvety, nectarous mango pie will simply blow you over! It sure was an exciting experiment for me to put together this recipe the first time I made it, a couple of years ago. Now this exquisite pie has become my ‘go to’, ‘goof proof’, and ‘crowd pleaser’ dessert recipe for the summer! Mango is called the king of fruit in India. This pie will tell you why! I use the canned mango pulp from India because in mind there is no substitute for the divine taste of the Alphonso or the Amrut mangoes. You may use the other type of fresh mangoes. Make sure to add sugar according to your desired sweetness. The cream cheese gives me the satisfaction of eating cheesecake but with an airy mousse like texture! And as for time….Do you have those times when you feel overwhelmed about the menu you planned and there is a time crunch? Well, this easy breezy Mango pie has always made me look so goodJ And because this recipe can also be made in a jiffy using the readymade crust and whipped topping, while it refrigerates to set, I am free to move on to making the rest of the meal. So it is an all-around ‘win win’ situation for me with this special dessert. Do let me know how you like this Mango pie. I am sharing with you one of my absolutely favorite desserts, my dear friends! 1(10 inch) graham cracker crust, homemade or readymade such as Keebler brand graham cracker crust. Add the gelatin in the glass of warm water. Stir until it is completely dissolved. Blend together the dissolved gelatin mixture, the cream cheese, mango pulp, sugar and salt. Fold in the whipped cream or topping. Pour into the premade graham cracker crust. Cover and refrigerate to set, about 4 hours. Enjoy! I am taking my Mango pie and joining the fiesta hosted by the ever gracious Angie co-hosted by Quinn and Naina Looking forward to seeing these amazingly talented friends. I am sure I would love this. The ingredients sound delicious and absolutely like the way it is decorated! Enjoy your weekend, Sandhya. Thank you so much! Enjoy your weekend too! Yumm Sandhya, this does look like a winner! A cooling, refreshing mango dessert. Was it easy to slice after being refrigerated? I love Alphonso mangoes too, and we use the pulp to make milk shakes and also kulfi. I like the addition of the gelatin, guess this is what makes it light and airy right? Also, I may try it with a gingersnap crust that I usually make with my cheesecake recipes. Thanks, will def try this. Thank you Loretta! Yes it is very easy to get clean cut slices. I also like ginger snap crust with this one. I was thinking of writing that in the post but forgot:) I love the combination of mango and ginger together. oh…….and p.s. beautiful job on decorating the pie. Your mango pie may be delicious but I love your flowers on top of the pie. What did you use for the stem? Thanks Judy:) I used the raw mango peel for the stem. So true about Alphonso mangoes, right? This pie is truly delicious! I would love to share a big slice with you too! Thank you so much for your sweet compliment! What a beautiful pie Sandhya! I just love mango and this pie would be delicious on those warm summer days. That looks fabulous and sounds wonderful! A true work of art! Mango pie looks tempting. Love it. Thanks for sharing the recipe. Would love it try it when I get Some mangoes next. Do let me know how you like it Preethi! Wow! How attractive! I have only had mangos sliced or crushed as for a smoothie. I would love to have a slice of this pie! OMG – this looks so pretty and I’m sure must be absolutely delicious. Thanks Madiha. The texture of this pie is very mousse like compared to a cheesecake. I love all mango recipes too! I love mangoes and if it has been so deliciously woven into a gorgeous looking pie like this it becomes all the more hard to resist. The pie has been crafted with so much love and deftness that it shines through and makes it a visual delight. Uber delish and droolicious. Thank you so much Piyali for your sweet comments. It truly means a lot to me! Thank you so much for your kind words Piyali! I am dancing here getting such a huge compliment from an accomplished person like you! Beautiful!! Love the toppings you have, so delicate and pretty! !